while all Indian states are complying with the Centre's notification on mandatory iodised salt from May 17, Maharashtra is still open to non-iodised salt following the Bombay High Court's interim stay on the notification. On May 16, the court had stayed the November 17, 2005, notification of the Union ministry of the health and family welfare (mohfw), which had amended the Prevention of Food Adulteration Rules, 1955, banning the sale and use of non-iodised salt. The stay will continue at least till June 30, when the court is expected to pass its final order. According to the amendment, "No person shall sell or offer or expose for sale or have in his premises for the purpose of sale, common salt, for direct human consumption unless the same is iodised." The Bombay High Court verdict came in response to a pil filed by a group of ngo s, who had challenged the m o hfw' s November 2005 notification. The opinion on salt iodisation is divided on two issues: one, iodised salt is unnecessary except in hilly areas where iodine deficiency is a common problem, and two, the high-cost of iodised salt puts a considerable strain on the common buyer. "In the mid-1980s, the Bhartiya Ayurvigyan Anusandhan Parishad (baap) and the Directorate General of Health Services (dghs) had conducted a study to ascertain the extent of goitre problem in Assam's Dibrugadh district. But both came out with divergent figures: 65.8 per cent as per baap and 19 per cent as per dghs ," says Smita Shah of Rashtriya Yuva Sanghatan, a Mumbai-based ngo and one of the petitioners. "Thus there is no credible data on iodine deficiency diseases in India; then why force the entire population to consume iodised salt?" says Shah. Mandatory iodisation will only favour large companies, fears the pil . In India, over 70 million people suffer from iodine deficiency diseases and another 200 million are exposed to risks. At least 254 out of 312 endemic districts are deficient in iodine and around one-fifth of pregnant women are at the risk of giving birth to children with physical and mental disorders. Meanwhile, researchers of aiims, New Delhi, have found that consumption of iodised salt has reduced goitre prevalence among school children from 55 per cent to 19.7 per cent between 1979 and 1989. 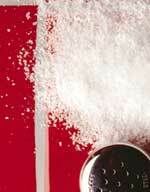 Indian government had introduced similar ban on non-iodised salt in 1997 but lifted it in July 2000.